ORD as a hub was not profitable due entirety to China. Without China its solidly profitable moving close to the DFW, CLT type of profit..
Now maybe that all changes at $30 oil? The flights have been gone for just over 3 weeks now and it's already had that kind of impact? To even know this level of detail would require intimate knowledge of AA's P/L by route/hub. I strongly suspect that United is looking at mostly the freight component of EWR-PVG. because with enough freight? The Passenger component is Pure Profit!! It's the freight that pays the bills in the belly..
Have you tried Rick Bayless' place "La Frontera"?? If you haven't?? You've missed the BOAT!! Rickh Bayless makes better Mexican food than the majority of Mexican Chefs. This is statement is completely inaccurate. We know based on publicly released documents that ORD-China routes had a -5% margin. We also know based on publicly released documents that DFW/CLT/DCA have an average margin of 13.1%. If ORD “was not profitable entirely due to China” as you state, then mathematically there is no way for the discontinuation of China routes to bring the margin of ORD to the same levels of DFW/CLT. As a side note, AA described ORD (as well as PHX) as financially solid. This to me does not sound like an unprofitable hub. Yes from your view yes maybe, but we don't have all the information that the airlines AA does. So were guessing at profitability and there plans. DTW-SFO/LAX/SEA prints money. There is simply no way DTW-PVG prints money when DTW-LHR is half the distance and charges almost the same fares. In March/April, you can find sub $1000 R/T everywhere on DTW-PVG. And that's only looking at the direct traffic. a flight through DTW to PVG is going to rely on good amount of connection and the connection traffic to China is very low yielding stuff. I took a look at R/T fares on DL from a bunch of airports like ORD/IND/STL/CVG/CMH/BOS/MSY to PVG via DTW. It's all priced at $850 or lower after Chinese New Years. They are pricing J fares pretty high but DTW-PVG is on those super low density A350 suites so they have to charge more. I’m not sure making a judgement based on low coach fares makes much sense. I think it’s pretty well known that coach traffic loses money on long haul flights (especially ones over 7000 miles) but the front cabin and corporate traffic is what makes or breaks these kind of flights. Printing money may not be the correct term though - but I’d guess it is healthy P/L wise for a 7000+ mile flight. I also wouldn’t call the A350 low density in premium cabins - sure they reduced business class from 48 (747) and 37 (777) seats but there are 32 business class seats and 48 premium economy seats. AAs 788 had 28 business class seats and no premium economy which likely was a big part of the problem - they were chasing $600RT coach traffic and had so few premium seats that mathematically it would be tough to turn a profit. In my opinion UA does China (and Asia) best with larger business class cabins - most cabins on 789/772/77W have ~50 seats. DL/AA fleets seem to be configured for the TATL/Latin market where stage length is 1/2 the distance and premium demand less with considerably lower fares. Probably helps that TATL coach fares are much healthier with the major 3 alliances controlling around 80% market share thanks to their JVs - Asia is much more fragmented. Thank you. This is one of the most sensible discussion I have read in this thread. I think AA management is making a huge mistake by flying this route with 20 J seats B788. With one seat blocked, the saleable J seat is 19 in reality. (788 is going through a programme to reduce J seats from 28 to 20). So the 788 is not a good plane for this route. ORD to PEK or PVG needs more J seats to match United or Delta. Flying a plane with 19J seats while others have 44 or more is a way to say that I concede. The danger of this is when competitors sell the J at a discount, you are forced to follow or you will loose the sale. And by the time the competitor sold 10J seats, you sell 10J seats, the competitor could have 30 more to sell to high fares and corporate world. And you, AA, only have 9 seats left so you have to set the fares much higher to achieve yield. But your competitor would have more room to wiggle at fares as they have more supply. In the end you can not sell the remaining 9 seats and end up give them to free upgrades and the yield is trash. While your competitor can fly the back cabin empty but have a full front cabin and enjoy higher revenue and yield. B788 with 19J saleable seat is wrong plane for a market that you are loosing. It is good for secondary European cities and Latin America cities where youngster advantage. So you know the demand and can manage as the market leader. But for Asia Pacific market, as a follower, you need to have a disruptive attitude and try to squeeze more yield a d revenue by flood the market with supply of premium commodity. But then, the 777 is too big plane when your market share is low. 789 seems to be better fit but needs market to examine. I think current AA management has too much problem with chasing premium traffic or are choosing sell J seats at unreasonable market price rather than BAs approach of using abundant supply to deter competitors. I wish the original LAA management can come back to lead the vision less LUS management. Obviously, AA’s suspension of ORD-PEK/PVG has led to a chain of reactions we are witnessing now among US’s biggest three carriers. Which carrier do you find more justified in their argument? If you were in the position of DOT, how would you arbitrate? And what do you think would be the most likely outcome by DOT? Any airline that suspends a previously awarded slot should have to give it up immediately. The airlines requesting those slots should have to start the service within 180 days. "American is actively cutting flights in transpacific, where we don’t have these [joint venture] partnerships, and growing in the transatlantic where we do," says Raja. Does the JAL JV not count?? The Passenger component is Pure Profit!! It's the freight that pays the bills in the belly.. Despite how often it's repeated, there's not a hint of truth to that kind of statement. I would challenge you to show the SLIGHTEST bit of evidence about ANY scheduled transoceanic pax flight where freight alone "pays the bills." Last edited by LAX772LR on Fri Dec 07, 2018 6:21 am, edited 1 time in total. Honestly it doesn’t seem like it’s going well with current management, out of NYC AA fares are often 3k higher on J class vs JAL for the same flight, in a lot of TPAC cases it seems like they’ve given up on competitive pricing for the NYC market. The AA/JL JV does seem to be the weakest of the US3 JV's. I blame JL's extremely conservative management for the impasse. JL seems to have little interest in building out its intra-Asia network (largely because its low density aircraft make their costs too high vs NH and the other major Asian carriers) and is overly focused (IMHO) on the needs of Japanese passengers vs those using TYO as a connecting hub. I think the most reasonable and probably outcome is for the DOT to defer the DL/UA application and grant AA dormancy for one year. If AA does not resume service within the prescribed timeline, these frequency can still be assigned to UA/DL for use in 2020. Considering both UA and DL received dormancy waiver for China frequencies in the past (some much longer than AA is requesting), and no other airlines has been given an 365+ days start up time, it will be unwise for DOT to set such a precedence and unfair to AA given their lack of onward China partner until recently. UA received a dormancy waiver for China frequencies in the past, but they were for frequencies that no one else wanted. In this case, there are two other carriers asking to pick up the abandoned frequencies. If AA wants them, they should fly them! The problem with that is a 2020 start up date will likely not happen as it does take some time to get slots at Chinese airports. IMO the most reasonable approach is (1) grant DL's application as it is from non-AA frequencies, (2) grant UA's application for 7 of 14 frequencies of AA's and (3) grant dormancy for the remaining 7 AA frequencies. AA shouldn't get 2 daily flights to sit on, 1 is completely reasonable. DL received dormancy request on ATL-PVG for around a year. I agree that those frequency should be not left unused, but even if not granting AA the dormancy waiver and giving those frequencies to UA/DL, they are not going to fly these frequencies until 2020! That, from a public interest perspective, is materially worse than granting AA the dormancy waiver because these frequencies will definitively not be flown until June 2020, whereas AA only wanted dormancy until June 2019, which means that there could be a possibility of AA resuming service in 2019, reducing the period of "actual" dormancy to less than one year where as the DL/UA proposal will result in a "actual" dormancy of almost 2 years. Even if granting AA the dormancy waiver but AA later decided not to resume these routes in 2019, there is still one year (which is double the standard DOT start-up time) for UA and DL to prepare and resume service, causing no material harm to DL and UA in their plans to start service in 2020. Given their close relationship with their respective partners in China (DL even said they can obtain slots at PVG in less than 90 days) I tend to agree with AA that they will not need more than a year to obtain slots. Yet DL isn't requesting AA's frequencies, UA is. UA has made no such allegation they can get slots in less than 90 days. Further, AA said they would announce in June 2019 what they were doing. Which pretty much means they wouldn't do anything until 2020 either. So, all 3 flights won't start until 2020. Do you let AA keep 2 daily flights or give UA 1 since it has concrete plans. There is absolutely no basis for a dormancy waiver of 2 flights for AA when there are no concrete plans. AA did not make any statement regarding not resuming until 2020, yet UA and DL made, in written documents to DOT, that they would not start service until 2020. Instead, AA has made it clear that if AA decided not to resume these services in 2019, the DOT would be free to allocated them to other carries. Your assumption "which pretty much means they wouldn't do anything until 2020 either" has no fact to back it up. Now, is it possible for AA to ended up requesting an extension of dormancy waiver when 2019 comes or simply not restart and let the frequency return to the pool? Yes it is, but then at that point, the DOT can just give those frequencies to whoever still interested and they still have one full year to plan the service. But is it also possible for AA to submit plans to resume services in Nov 2019? Definitely yes as well, and in that case the public benefited because there are more competition from 2019-2020, which DL and UA are unwilling to provide. Considering DOT's recent allocation focusing on introducing competition among carriers, and given that DL and UA all has stronger market position in China (especially UA) than AA, it will be in the best interest of the public to let AA have a bit of time to rethink its strategies in Asia and what it can do now it has a strong China partner before rushing to make a decision that clearly can wait. Again, I think the core here is that I'm not buying UA and DL's argument that they need 18 months to secure slots in China, especially when they both have strong partners that can pull some strings or just give them one of their unused slots. Finally, there is no one carrier wanting another one's frequency here. According to DOT past practices, these frequencies applications (along with the dormancy waiver) are normally allocated in a consolidated fashion ( I cite 2007 China Combined Frequency Allocation). So I think your statement reagrding "UA not DL wanting AA's frequencies" are incorrect. I have to disagree with your post, although UA was granted a dormancy waiver for some time, when that waiver was received there were frequencies available which were going unused. Also if I'm not mistaken at the the time the dormancy waiver was issued neither DL or AA was interested in increasing their U.S. - China frequencies. Also when UA announced intentions to go daily double they state the reason the service wouldn't start till 2020 is because they need time to negotiate with China in order to secure a favorable slot. There is no need to negotiate with China for a landing and take off slot if the DOT doesn't award you a frequency. And as we all saw with AA's ORD-PEK frequency at first they delayed the start up of the flight do to a less than favorable slot then for a few years they were forced to fly the route with that less than favorable arrival slot. In the end they were able to negotiate for a better arrival time slot but it wasn't what they wanted which was an early or mid afternoon arrival time slot. I'm not sure how many people in the past actually paid special attention to the negotiations airlines have with China when they add service to crowded airports like PEK and PVG, it has been notated many times on this site just crowed the skies over PVG and PEK have become. Personally I think AA should be given till June 2019 to put these flights back on the schedule, service to begin in October or November 2019. When June 2019 comes around if AA has not announced firm concrete plans to resume service utilizing these frequencies then I think the DOT should at that point award should award DL, MSP-PVG; UA, EWR-PVG 2X daily, and give AA a dormancy waiver for one of their unused frequencies and that dormancy waiver should expire in November 2020. If they aren't using that frequency come November 2020 at that point it should be returned to the DOT if no other airline has submitted an application to utilize the remaining frequency. Awarding DL and UA the frequencies in June or July of 2019 gives these airlines in my opinion enough time to negotiate with China for the time slot they believe works for their customers. Also one last thing if AA truly believes the tide will change if they can cultivate a closer relationship with China Southern then I think they should fly the routes now, even though the routes are loosing money. If AA believes they are close to developing closer ties with China Southern which would benefit them and their customers why cancel these routes when you know how highly valuable these frequencies are especially if you are so close to a deal with China Southern? I'm not sure if AA's rebuttal helps or hurts their case for a dormancy waiver. Also one last thing if AA truly believes the tide will change if they can cultivate a closer relationship with China Southern then I think they should fly the routes now, even though the routes are loosing money. If AA believes they are close to developing closer ties with China Southern which would benefit them and their customers why cancel these routes when you know how highly valuable these frequencies are? AA is doing nothing more than stalling. They should tell AA to come up with a firm re-start date, and if it is on/before the proposed UA 2020 date, then grant dormancy. If they continue to say they want until June 2019 *to make a decision,* they shouldn't be granted the waiver. A bird in the hand is worth two in the bush. I think my original position somehow got trumped in the discussion. My opinion has always been the same as yours: grant the dormancy waiver for one year but require AA to submit plans to resume before June 2019 (which is what AA said they would do) and if they don't have plans to resume by Nov 2019 then allocate the frequencies to DL/UA and they would still have enough time. I stated this above and you dismissed it as baseless, but do you really think AA can announce flights in June 2019 and resume by November 2019? That is wholly unrealistic. ORD-Chicago was *bleeding* money and they would have known CZ was leaving SkyTeam and could bulk up their partnership. Practically, there is no way AA starts flights before 2020. Not to hijack the thread, but could someone tell me if the AA/HU partnership is DOA after all these cuts and CZ deepening their ties with AA? I started a separate thread about that, and it's gotten no replies. Thanks in advance. And AA today decided to copy DL playbook. American respectfully requests that the Department grant all US carriers that hold US-China Zone 1 combination frequencies the flexibility to use their frequencies on any US-China route where they hold underlying route authority. Delta and United currently hold many China Zone 1 frequencies that have this flexibility, while all of American’s China Zone 1 frequencies are route-specific and cannot be moved without the Department’s approval. To ensure that it can respond to changes in the U.S.-China market as effectively as Delta and United can, American seeks to replace the two-tiered licensing regime for China Zone 1 frequencies with uniform China route flexibility. Delta and United have enjoyed their exclusive China Zone 1 flexibility to make significant changes to their US-China networks without the need for the Department’s approval. For example, in 2018, Delta used its flexibility to relocate its frequencies used for Tokyo (Narita)-Shanghai service to the Atlanta-PVG route (OST-1999-6323 (July 19, 2017)). Likewise, in 2004, United used its flexibility to launch its San Francisco-Beijing service by relocating frequencies previously used for NRT-PEK service. 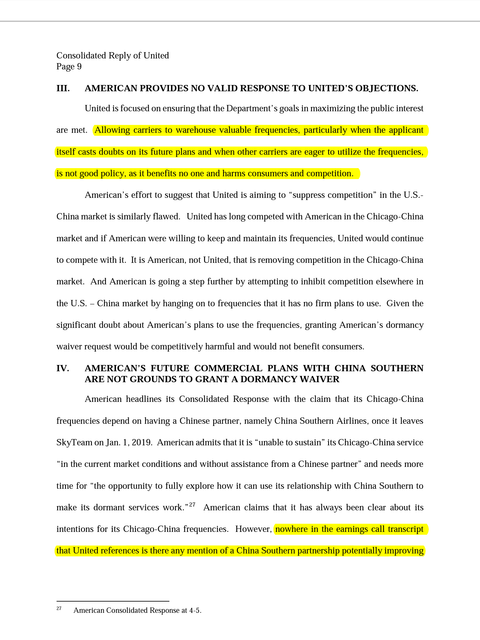 American cannot make similar changes to its own US-China network without filing a motion to transfer its frequencies, likely triggering a lengthy administrative proceeding and risking the possibility that its frequencies would be reassigned to another carrier instead, such as Delta or United. Delta and United may also use their China Zone 1 route flexibility to respond to short term surges in demand. For example, this month Delta is using its “unrestricted, gateway-flexible US-China Zone 1 frequencies” to offer nonstop service between PVG and Las Vegas for the January 2019 International Consumer Electronics Show (OST-1999-6323 (September 14, 2018)). Again, American cannot launch similar services using its own frequencies without the additional step of seeking prior Department approval and the risk of opposition by other carriers that would delay or moot the request. American is filing this motion in conjunction with its answer in conditional support of the motion of Delta Air Lines, Inc. for US-Haneda gateway flexibility. Answer of American Airlines, Inc. in Conditional Support of the Motion of Delta Air Lines, Inc. As American explained in its answer to Delta’s motion, the reasons for the Department to grant flexibility to all carriers holding China Zone 1 frequencies are at least as compelling, if not more so, as the reasons for providing similar flexibility with respect to Haneda slots. To the extent necessary, American incorporates its answer to Delta’s motion herein. Trying to link China route case to DL Haneda motion. I knew it would only be a matter of time before both of these issues became connected. From AA's response it seems like they no longer want a dormancy waiver instead want freedom to move their frequencies to a different gateway. If ORD-China isn't working for them perhaps they want to try PHL-China or CLT-China. While they may have better luck out of PHL or CLT its only a matter of time before the Chinese carriers arrive at those hubs. How will the DOT rule I can't wait to see how this all plays out. I can guarantee if ORD-China wasn't working .... CLT-China has ZERO chance. Laughable. A matter of time that really is up to the mercy of international politics and demand. Without expansion on a new bilateral agreement between China and US, no Chinese carrier get to add flights from 1st tier Chinese cities (aka PEK+ZBAD+PVG+CAN) to contiguous US. However, it is completely possible that HU will seize PHL and CLT upon availability of any flight rights. By the way, does DOT tend to offer support on flight rights for the weaker airline? AA is absolutely the worst performing one out of US3 on Asian affairs (with a mere 28 weekly as of 07JAN19), with DL and UA owing much more. Given the extraodinarily late time that UA and DL wishes to start their new US-China flight, I would rather deem DoT inconsistent in making desicions for not allowing AA to freeze their flight rights and make them convertible (in case PVG-ORD doesn’t work out, get PHL-PEK). I see no reason not to approve AA’s request here. They seem to be the low fare leader of the China market so it benefits the consumer (see their $280-290RT prices exit-CN on PEK/PVG-LAX). If they were to move these to secondary hubs like PHL/CLT/MIA I think the consumer would be happy with cheap prices and it would open up new markets. What I don’t think should happen is swaps between PEK/PVG as I think everyone knows PEK is a leisure market and a real dog while PVG sees great front cabin yields and corporate demand. From an industry profitability and sustainability standpoint, AA’s exit would help immensely. There is a case to be made that they are worse than the HU/MU/CZ/CA in pricing practices with no segmentation and fares far below cost exit-CN where a lot of the demand exists. They are drowning in the market - likely losing upwards of $150M a year (after cutting ORD they seem to be trying to lose even more on the LAX flights!). I’m just not seeing their long term vision unless it’s just a short term share play. Doing simple math any human can see that $300RT fares in coach on their LAX flights equates to a 1.5-2 cent yield (after taking out the ~$90 for govt taxes) while cost has to be north of 10 cents. The fact that no other US or Chinese carrier is matching those low price points really says something. Will be interesting to see how the DOT rules and what AA’s China future looks like! LAX... its Chinese market is beyond saturated. It isn’t American’s fault that they can’t earn money for ORD and LAX, airlines like HU is more likely. After all, it is HU that pioneered their way for 2nd tier-1st tier long haul for China, but HU gets subsidies, while AA doesn’t. The market does exist and is growing. Given UA and DL’s late date (unprecedented) for planned startup, it is pretty legitimate for DOT to just ignore these requests until within 9 months of their planned inaugural (planned approx. 31JUN20). Or, they simply have a bilateral agreement update and allocate more flights for both sides to fulfill the need of both sides. But US politics now makes it highly unlikely. No doubt CN-LAX is saturated but I’m not seeing any carrier (nonstop especially) filing the junk that AA is in their own nonstop markets. In regards to subsidies - AA could start KMG-LAX or SZX-DFW tomorrow and receive a $50M a year subsidy for 2-3x weekly service. Look at UA - they got huge subsidies from HGH and XIY and when the well ran dry....the flights bit the dust. I do agree though that DL/UA should have to start before summer IATA 2020 to get the available tier 1 frequencies. I believe AA will pull the typical squatting move and try and keep the frequencies though as 33% of their CN network is suspended at the moment. It’s not a slot, it is a frequency. Does anyone think the Chinese government and by extension carriers are trying to drive all US carriers out of China? Pretty much guaranteed that they'd move the Chicago flight(s) to do double daily from DFW. The market itself is doing that. There is not a lot of high fare traffic to China. There was a lot of 1990s era competitive jockeying to be The “winner” in China. In some businesses that was a real phenomenon. For airlines, it was a mirage. CEOs were falling over themselves to introduce routes that lost a lot of money. Hard to explain. It was for bragging rights on the golf course and at executive retreats, or something. Allegedly UAL makes a bit of money in China but idk. I find it tough to believe only AA is losing money. But ord was over served. KMG is 6900ft above sea level. It is absolutely insane to fly 13 hours from it (to LAX), even (a lot) more unimaginable than DEN-NRT. Nor was KMG standing out on its remaining intercontinental network compared to XIY or CTU. After all, Yunnan province is one of the “poorer” provinces of China and it’s totally, totally impossible to give 50 million USDs per year transporting empty seats. This isn’t happening! SZX... this case is particularly intriguing. At least, SZX is willing to give subsidies (otherwise HU won’t operate those nonstop to second tier European cities which aren’t nonstop accessible even by CX), and they have better economy. But do you know that it only demand 90 minutes now from Shenzhen Futian HSR station to HKG airport by riding the HSR? That surely is a huge inconvenience, but is less if your alternative is 2 weekly worth of LAX nonstop+3 weekly worth of SEA nonstop. That can be digged in deeper, seriously. DFW seems to have an underrepresented position in TPAC flights (while W.Coast Is overrepresented), and is legitimate to demand more traffic capacity westbound. But directly placing DFW-SZX is like slamming the face of CX, and will intensify its potentially strained relationship since the 2017 stock purchase of CZ. Nor was it ideal to place 2 destinations just mere miles away. A legitimate idea is to add CAN and CTU. As far as the bilateral agreement goes, there is 1 exclusive CAN only daily for US carriers never used (nearly used by UA in 08, but cut by financial crisis), while only 3 out of the 32 (maybe?) 2-tier Chinese city flight frequencies operated by US carriers are used (also used by UA). CAN has long been underserved in TPAC markets, with all routes to contiguous US having over 90% load factor; a 789 can solidify the profit in no time. Meanwhile CTU is a new booming market. If they do receive enough subsidies to fly, they should. Also, gven CZ’s larger presence in PEK (than PVG), they may legitimately convert PVG-ORD to PHL-PEK(for example) to shift its focus. UA gave AA the burn: "AA’s future plans with China Southern are not grounds for a dormancy waiver"
aka "We don't make any money now, but we think we will when we finally have a partner". There is no way the DOT will let frequencies be held up without commitment. UA/DL will get another crack and put them and AA in their place at the back of the line. Considering they spent a considerable amount of time and capital to prevent JAL from aligning with Skyteam and Delta, it surely has paid off. DOT has granted American's 90-dormancy waiver for services between Chicago and Beijing and Shanghai, China until June 28, 2019. DOT also deferred action on DL and UA request to utilize the slots themselves with alternative services in 2020. DOT, however, did suggest the airlines update their proposals closer in time to the expiration of the AA waiver and closer to their own anticipated launch dates, when DOT would be able to better assess the market and make public interest determinations. (In other words, should AA not resume the flights to China as anticipated, the DOT is open to reallocation at such time). I don't see AA restarting either service by 6/28/2019... They don't have very much time to market those flights at this point, and they've already allocated the 788 fleet to other routes for summer. Let alone the fact that they'd presumably need to obtain slots at PEK and PVG to restart either service (I'm assuming their slots were reallocated to other airlines after AA dropped their services?). If AA wasn't able to sustain service for some reason, how can anyone expect the results to be any better after going completely dormant in the market and then try entering at a later date? Meanwhile UA is probably gaining a majority of AA's lost pax and further entrenching themselves as the 'go to' US carrier from Chicago to Asia. Even if UA's ORD-China service is also money-losing or borderline profitable, it is now losing less or even more profitable. Granting the waiver was probably not a surprise as DOT will often accommodate such request. Will be more interesting to see what happens downline, and what excuse AA must think up of to avoid having to relaunch later this year. The alternate service proposal arguments will be much more compelling at such time. Agree. Also, this statement is incorrect "In other words, should AA not resume the flights to China as anticipated, the DOT is open to reallocation at such time." AA never stated they would resume services by then - so they are not "anticipated." AA, however, did say they anticipate announcing what they plan to do with the frequencies by then - very big difference. In a strange way this is probably the best out come, neither DL or UA need the approval at this time since they their proposed services were not scheduled to begin until mid 2020. AA now has the breathing room they wanted but its temporary and the chance of AA restarting ORD-PVG/PEK is low this means AA has 90 days to figure out where they would like to reallocate these frequencies. Also this is could also be construed as DOT telling UA they might want to reconsider their application as well, UA could always upguage EWR-PVG to a 77W. If UA believes their network needs more overall capacity they might want to consider IAD-PVG. I think DL for sure will get MSP-PVG, if AA does nothing after the 90 days and UA leaves their application as is, the DOT may extend AA's dormancy waiver if AA requests an extension. However, if AA requests another extension after the 90 day period and UA amends their application to say IAD or maybe even DEN things may get a little bit interesting. Slots are not an issue. Remember, they do have somebody with LOADS of slots in PEK and PVG willing to give them to friendly allies. 788’s availability is another problem, but by ceasing some domestic widebody services (I.e., cancel the original DFW-ANC 788 and move it to 752 as used to, CUN,ORD,MIA... you name it! ), I guess that problem will be resolved. 788 availability didn't seem to be an issue when AA was operating these routes from ORD for the past few years utilizing 788s. AA doesn't have a 788 availability problem their problem was their ORD-China routes were not meeting expectations financially. If I'm not mistaken AA stated as much when they announced they would be canceling/suspending the routes. AA has plenty of widebodies at their disposal a simple reshuffle would get them the three 788's they would need for these routes. The reason AA exited the ORD-China market was for financial reasons not because of aircraft availability. Exactly. AA can operate the route, but it is not profitable enough to keep it due to immense competition, so they stopped. But... yeah, keeping the precious frequencies in hand may be more than the money they lose operating, I guess.